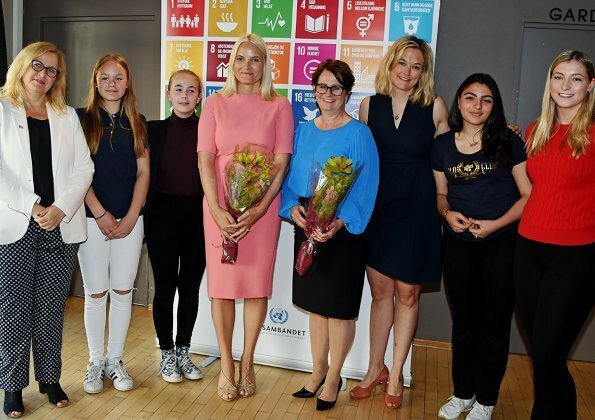 On May 24, 2018, Crown Princess Mette-Marit of Norway attended a student seminar about UN Convention on the Rights of the Child held by United Nations Association of Norway (Norwegian: FN-sambandet) at Cinemateket in Oslo. The FN-sambandet aims to inform schools and media about the United Nations activities. Die Farbe (Hummer, Pink) ist super für die KP. Der Ausschnitt des Kleides weniger. MM ist mit mehr Busen gesegnet, da passt ein V-Ausschnitt besser. Sie sollte ein bisschen Dekolleté zeigen, sonst staucht's. Länge ist gut und die Sandaletten auch. She still needs a better bra. Nice dress. Flattering, fresh and fun colour, good length, good shoes. I agree that the dress had looked even better with a different neckline, though I would personally prefer a square one over a V-neck. MM looks wonderful today the dress is a great color for her and it fits,but her best feature today is her big smile. 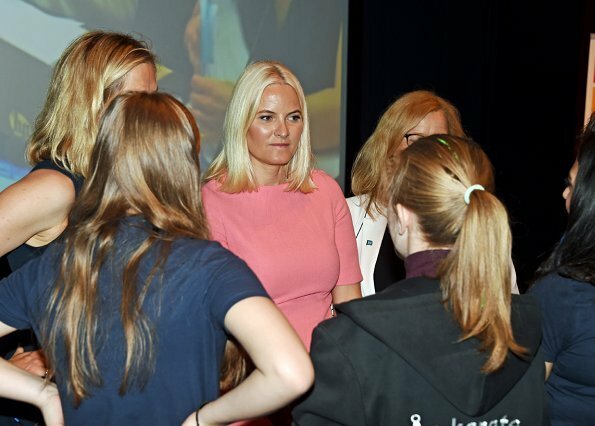 So nice to see Mette-Marit in such a pretty color!